Frankly, I never expected my mother to visit Korea while I was here. This is the same woman who visited me only once during my four years of college in Boston. And who did not visit me at all during my two years of business school, when I was only a two-hour drive away. The flight to Korea is much, much further from the US. If you are lucky (and rich) enough to book the one daily direct flight a day on Korean Air from Washington DC to Seoul, you have 14 hours of flying delight in the economy class cabin. Add on several hours if you have connections. So when my mother announced just before Korea's Chuseok holiday in September that she had booked a ticket for Korea, I was more than a bit shocked! It would certainly be good to see her in my new, temporary but semi-permanent expat homeland, but I also felt a bit apprehensive. Would my mother and I have our usual petty squabbles? Would I grow tired of having her in my house for 10 days? And would my mom be able to hack getting around on her own on the days when I needed to work? (I only had a couple vacation days available to show her around) Again, my mom doesn't travel well, and this would be her first visit to Asia. Having my mother in Korea was interesting because it provided a window into some of the emotions I felt when I first arrived in Korea last year. As an expat, you grow accustomed to certain everyday difficulties and develop enough survival skills to get by day-to-day. Korea is not a very accessible place for the independent, non-Korean speaking traveler, and my mother fits the stereotype of the American traveler pretty well – always insisting that other people speak in English! I at least understand enough Korean now to navigate around, and when I brought my mom onto a Seoul bus for the first time I remembered my own first intimidating experiences with the system when I first arrived. My mom had many of the usual observations about being here. "Seoul is so crowded." "Everyone is on their smartphone." "The women have had a lot of work done." Eating was a little difficult for my mom as she didn't handle the Korean level of spiciness too well, but she was a good sport about trying Korean foods. It also quickly became clear that she could not use chopsticks, but thankfully all restaurants had forks! She tried many new dishes ... bibimbap, bulgogi, samgyeopsal, samgyetang, and haemul pajeon, to name a few. And she was always asking me about the little side dishes which are typical of so many Korean meals. 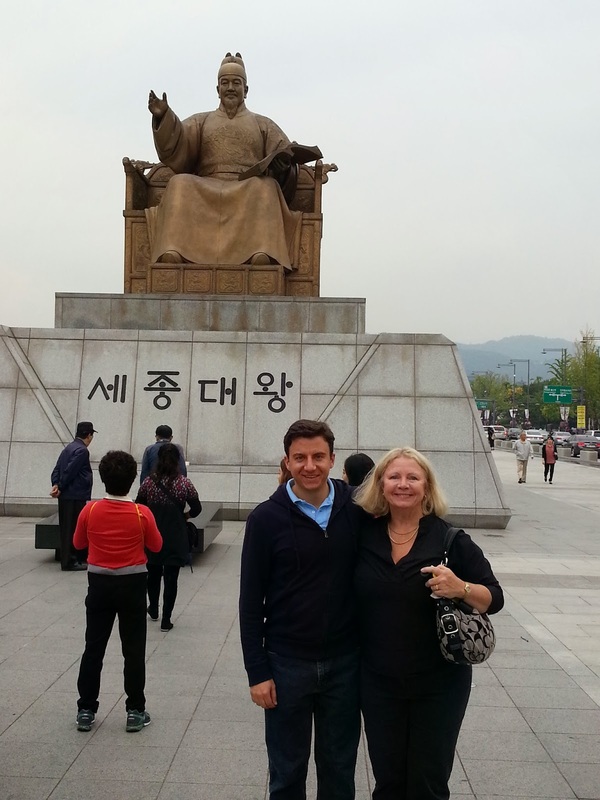 Walking is difficult for my mom nowadays so Seoul sightseeing really tired her out! We did the usual tourist circuit of activities, such as Insadong, the Bukchon Hanok Village, and Namsan Tower. My mom was a little out of it but came away (correctly) with the view that Seoul is a massive city. 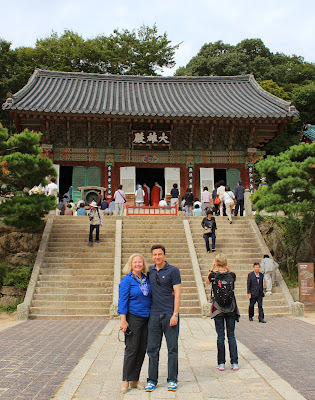 For my mom's last few days here, we took an adventure which I have never done before: a Korea road trip! I wanted my mom to get out of Seoul to see the countryside, especially as Mom needed to experience a little bit of nature. Driving in Korea is not for the faint of heart. Cars weave in-and-out of lanes, drivers routinely cut you off, and Korean cowboys zoom past you in their speeding Hyundais only to slam on the brakes to avoid being flagged by omnipresent speed cameras. One travel guide I read put it as such, "Remember that Korea was once a very poor country and therefore is only in its third generation of driving. Please be careful." Plus though most road signs are translated into English you're still missing a lot of information that is posted in Korean. Nonetheless, my mom loved getting out of Seoul. We headed southeast to Andong, the "spiritual capital" of Korea, and caught a glimpse of its well-known annual Mask Festival. I say glimpse because my mom was overwhelmed by all the people ... we got on the road quickly to our second stop: Gyeongju. I took my mother to the same sights that I visited with Samsung during my orientation, and my mother also was able experience a formal Korean lunch in a small house. 맛있어요~! (delicious) On our final day, we traveled to Busan to see the beach, a couple temples, and (my mother's favorite) Spaland in Shinsegae Department Store. Busan drivers were, by far, the worst we encountered in Korea! Safe to say that this was more time than I had spent with my mother in years. I really enjoyed having my mother in Korea, and I also really enjoyed when she left as I had my apartment to myself again! My mom still wants to know when I am "returning home" to the USA, but I think after her visit she is now comfortable with me living here. My mother's eyes were opened to this mysterious place, and I'm glad that South Korea no longer just means "Kim Jong Il" to my mother anymore.